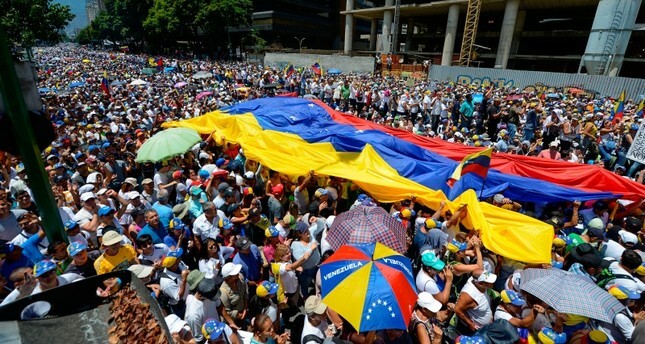 Two rival rallies took place in Venezuela's capital on Saturday after blackouts that left people without electricity and water. Venezuelan President Nicolas Maduro supporters marched to the presidential palace, after he tweeted "Let's fill the streets of Caracas with joy." During the rally Madura said he is willing to negotiate and support any step for dialogue. In his remarks, he blamed cyberattacks from Colombia and Chile for the recent power outages. "They've resorted to cyber terrorism, to electromagnetic terrorism," Maduro told the crowd. "I ask for understanding ... we are in a true electrical emergency, a true national emergency." Opposition leader Juan Guaido, who declared himself interim president in late January, urged his supporters to be united and pressure the government until Maduro leaves. The rival displays came days after Venezuela's Constituent Assembly stripped opposition leader Juan Guaido of his parliamentary immunity on Tuesday, paving the way for his prosecution and possible arrest. The chief prosecutor's office has opened an investigation into Guaido and his alleged links to the blackouts and to "incidents of violence" in January, but it has not yet ordered his arrest or officially charged him with any crime. The U.S. government on Friday took another step in its efforts to force Maduro out, by imposing new sanctions on Venezuelan oil shipments, and promising "stronger action" against key ally Cuba for helping to keep his government afloat. Venezuela has been rocked by protests since Jan. 10, when Nicolas Maduro was sworn in for a second term following a vote boycotted by the opposition. Tensions flared when Guaido declared himself acting president on Jan. 23 -- a move supported by the U.S. and many European and Latin American countries.